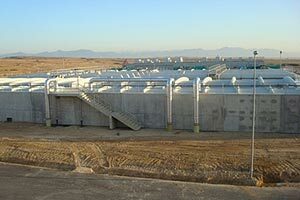 Stereau, the Saur Group’s specialist engineering company, has designed and built the Vathia-Gonia wastewater treatment plant in Nicosia. This new plant is the largest in Europe to apply membrane technology to wastewater treatment. The membrane filtration technology used here saves significant quantities of drinking water by making treated wastewater suitable for re-use in applications such as landscape watering, industrial use, crop irrigation and topping up groundwater supplies. Introducing the concept of reusing wastewater in a region affected by water resource poverty is particularly appropriate for places like Cyprus, which attract large numbers of seasonal tourists. The Saur Group has contractual responsibility for plant operation over a 10-year period.